During my master degree back in 2002-2004, I saw people at this age as somewhat old and mature. Sure I can accept to be a 38. Thou in many cases, people sees me as 20 something *cough*. Being mature is another thing. You can be 20s and mature. Maturity, for me, is a moment where you know your limitation and strength and can make the best out of it. You are solid enough to stand and face the good, the bad and the ugly in life. Past year has been a wake up call for me to learn accepting my new condition. As a mother of a toddler, a wife and business partner and a daughter with responsibility for family business, I need to measure my energy and time very well. Yes, I always want to be part of any positive social movement, as what I used to do. And yes, I still have troubled feeling toward extensive greed of my hometown development. My 37 can be seen as a failure. Failing to finalize many social works and commercial projects. It is a big slap on my face as if telling me you've dreamed too much and think beyond your ability. I was sadden by those condition that keep telling me I am a failure. I wish I could be like my 3y.o girl that doesn't care if her drawings distorted or her songs are out of tune, she keeps drawing and singing happily. But again, what is a learning process without failures? Those failures urge me to reposition my values in life. I don't want to fail myself, my husband, my daughter and my family at large. I guess, for now, that is my core value. May I find peace with myself. May I always have the child in me and be grateful with small things in life. May I always be built. Filled with otak-otak and es kacang, we continued our walk around Old Muntok. 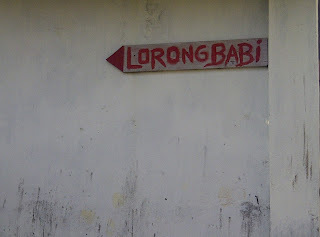 Few houses from Petak 15, there is a weird signboard : "Lorong Babi". We laugh at the funny words in the beginning and follow the direction it shows. We found a newly built kiosk in a dead-end narrow alley. In there, 3 men are selling pork. They were smiling and told us to come in. I asked them if this place is new and they approve. "We are moved here when they (the government) move the old market to the new one across the river"
I could see the new market from their stall…across the river. All of you are not joining the others to the new market? "No, this is the location for us"
I didn't ask further. It is clear to me. Johannes Widodo, our Keynote Speaker, coined "Meeting Pot" for Muntok. 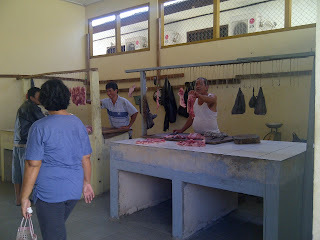 According to him, differences for centuries manage to live side by side in Muntok, without trying to convert each other. Islam is Islam, Buddhist stays as Buddhist, and so on. "Melting Pot is not the right phrase for Muntok" he added during his lecture. Lorong Babi shows different condition. The Melting has just started. I can't dismiss the thoughts of threaten pluralism in Muntok. 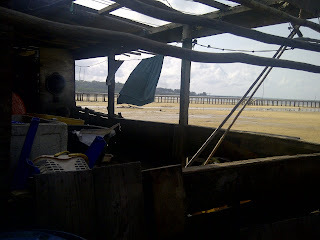 Walking out from Lorong Babi feeling slightly sad, I moved on towards the sea. Petak 15 is in dead end road. According to Ai Nie before they could directly access the beach. Houses are now blocking the view. I walk a little further into the houses then I saw a middle age lady waving at me from her window. Her house is a semipermanent wooden house. She was kindly asked my origin and what I was doing in Muntok. Conversation started and I could tell that she is a Javanese from her accent. I told her that I heard strong Javanese in her accent. Later on she explained that both her parents are Javanese but she is no longer a Javanese since she was born in Muntok. "Saya orang Muntok asli. Suami saya Cina asli!" (I am real Muntok. My husband is real Chinese) she said lightly and pointing to the veranda where her husband was working on something. 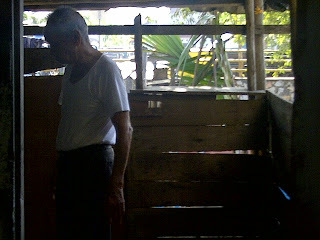 I took a peek to the veranda that faces sea, yes her husband looks very Chinese with dark skin. This old wooden house own a great view to the sea which rich people from Jakarta will pay trillions rupiah to have a house like that. I wonder if this couple enjoyed the view, too. I always trust that in daily life people can embrace differences. Some even do not recognize its existence. Things get worse when a higher level –whether government, political parties, religious leaders –sometime teachers do!—interfere that innocence with their unnecessary worries on differences. Issues on religious or race intolerance have been there for long in Indonesia. In these last few years, this issue is getting more transparent after democracy. Political Party with strong religious sentiment starts to openly criticize activities and culture that is not inline with certain religion, although most of them have been part of Indonesia richness since time of our ancestor. Acceptance of differences even appears in Bugis historical epic I Lagaligo. Sawerigading, son of Batara Guru and ancestor of Bugis people , tied knot with a Chinese princess, We Cudai. La Galigo is their son and become the center of this long epic. This epic shows for centuries diversity is part of our inherited culture. All political leaders and government should position their policy and decisions carefully within this given context. And in my opinion, Lorong babi shows Muntok new city leader has taken a not-so-smart first step to deal with this. 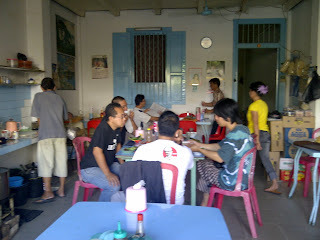 My trip to Muntok is made possible by mAAN. This year the design workshop subject is Mentok (or Muntok) a Tin Mining City. Some background of the workshop can be found in mAAN Mentok Tin Mining City Design Workshop official website. Muntok's golden moment was back in 18th century until the day of New Order, where national development was centralized in Java. Similar to other places outside Jawa, Muntok losing its importance, despite its richness as on of Tin mines in Bangka Island. Yesterday I didn't manage to walk around the city much. 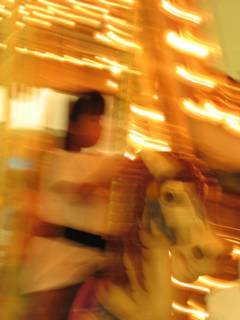 Yet, thru stories from Brain Team we can quickly assume the city loses it's main energy: Youth. *it will be really nice to have more facts from detailed demography statistic data...I will post it as soon as we get the data. Before discuss further on this assumption, I should underline that Muntok has important role in Indonesia Tin Mining Industry. Tin Mining sector considers as the largest contributor for this city income. With total area of 436 km2, PT. Timah area covers half of the land for their factory, port, offices and settlement. Around 700 people are fulltime worker in this company and about 255 people works as PT. TIMAH outsource. Yet, we are informed that in 10 years time, there will no more tin in Bangka. So Muntok, not just losing its youth also its income. Meanwhile, a city needs economic resources and productive age to ensure it sustains. JUST LIKE TIN OLD PEOPLE (WITH ALL RESPECT) WILL BE END SOON. 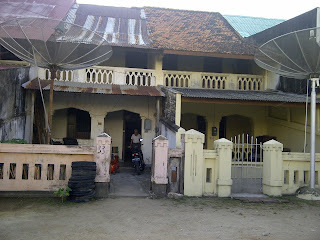 This morning I took a walk around the old city of Muntok. We started with a delightful breakfast at a coffee shop in Petak 15, down south nearby the old port. We are lucky. Not just the food and coffee are good, shop owner daughter was there and willing to seat and share her views about her hometown. This mother of Joshua (easier to ask little kid's age, he is 3 y.o) is just visiting Muntok to accompany her mother while her father is away for medical check-up. She moves out the city since senior high and continued her study in Jakarta. Meeting her husband in Jakarta, she now lives in Gading Serpong, Tangerang. My main intention is to cross check my assumption on 'brain drain' issue in Muntok. She approves it (yey!!) by saying it is a 'mindset' of young Muntokers (let's put it that way) to leave the island and chase better future in Jawa (mainly Jakarta and Bandung). hmm... there is no choices for better higher education (Bingo!) around here. But there is Universitas Sriwijaya in Palembang? I think it is also part of our mindset, that to get better future we need to be out of this city. Many of my friends now are successful in Jakarta or Bandung. They have more choices to be creatives. That is part of our conversation with her... I'll upload the voicenote *still finding way to do it* soon. Ai Nie is a full time mother that has big concern on children education. She is now doing homeschooling not just for Joshua, but also some other kids (the haves and the have-nots) in her garage in Jakarta. The way she tells story about her small 'school' (she calls it 'bimbel') shows her passion. (back to Muntok) She then mentioned lack of better education not just for higher education but also for little kids. According to her, this city is now mainly consist of both old and very young children. It is a good idea to give intention to young kids education in Muntok. She told us story of her childhood memory of Muntok. The coffee shop where we eat stands at riverside next to the estuary. According to her, it was mangrove site years ago, until the city build new market (Pasar Baru) on mangrove site leaving nothing but narrower river. River water was clear back then, where she and her brother loved to swim and do fishing. After meal, she showed us their back of house with direct connection to the river. River condition is sad: sedimentation from mud and waste piles up, no more clean water, no more childhood fun. She took us to her neighbour house, an old chinese not-yet-renovated rowhouse owned by an old man (I predict he's 80s) lives there with his grandchild. All rooms are still as it was. 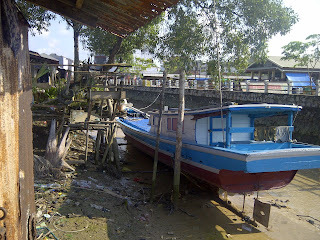 The wooden porch on riverbank is old but still can give us idea on how it was during old days. I imagine the old man used to sit on the porch drinking tea watching kids swimming in the river... what a gracious picture. We continued our trip, but before that I asked Ai Nie last question if she is willing to attend our mid-crit to give us (the outsiders) feedback on our proposals. She is eager to do that...and I am getting more excited to continue this workshop. Saking seringnya melihat detektif membeli 'hotdog dan kopi' di pinggir jalan, itu jadi hal pertama yang harus saya lakukan...Nonton di Broadway dan berteriak (untungnya saya masih waras :D ) di Times Square juga diagendakan. Kemasan film itu sangat berhasil membangkitkan antusiasme saya dengan NYC. Saat membeli Hotdog dan Kopi rasanya saya menjadi bagian dari NYC, sekalipun kemudian kopinya saya buang setelah seteguk (rasanya gak jelas!). Keberhasilan mengemas kota ini tanpa oleh TV dan film merupakan bentuk branding yang sangat mudah dimengerti semua orang, namun sering tidak disadari oleh para manajer kota. Berapa banyak dari kita yang mau mengenal Bangka Belitung sebelum munculnya Laskar Pelangi? Serial novel Andrea Hirata tentang pengalaman masa kecilnya menjadikan Bangka Belitung tenar, bahkan sekarang sudah ada 'paket tur Laskar Pelangi'!! Sayangnya belum banyak film atau novel kita yang menjadikan kota-kota di Indonesia sebagai setting cerita mereka. Keluhan yang sama yang saya temukan di blog Tempo tentang hal ini. Sekalipun demikian, ada saja film indie yang sudah melakukannya, seperti Cin(t)a dengan setting lembah Siliwangi di Bandung. Menonton film itu, rasanya kok ada saja sudut kota Bandung yang belum saya jalani. Pertanyaannya, apakah pernah pengelola perkotaan (baik itu pemkot maupun developer swasta) menyadari kekuatan ini? Mengembalikan pencitraan kota tua, mengangkat sungai Cikapundung, melindungi Babakan Siliwangi dan jajaran kepulauan Spermonde di Makassar bisa saja menggunakan tangan para movie maker. Mungkin menarik untuk mengumpulkan film dan novel yang mengambil setting kota-kota Indonesia sebagai koleksi...mungkin ada yang bisa memberi masukan? Tepatnya 5 tahun 2 bulan yang lalu waktu saya backpacking ke Itali dengan 2 wanita Asia lainnya, satunya Taiwan dan satunya RRC. bagian yang tidak bisa lepas dari ingatan ini adalah rute berkeliling Tuscany. dan yang terindah adalah termenung mendengarkan bunyi lonceng-lonceng gereja di ladang Tuscany sambil duduk di atap gereja tua...memandangi padang keemasan itu. penggalan perjalanan di Tuscany ini bagian yang tidak akan pernah hilang dari ingatanku. "Tuscany is where time stands still"
begitu kata teman Jerman saya saat saya ceritakan rencana ke Itali setelah retreat 3 hari di Taize. "it's a great place for clearing one's mind and picturing future"
yep..mungkin begitu tapi yang jelas sepanjang perjalanan itu, sebagian dari diri saya sudah tertinggal di Tuscany. selama 5 tahun ini pikiran tentang Tuscany sudah mulai memudar didominasi sibuknya rutinitas sehari-hari dan beberapa perjalanan bisnis ke berbagai tempat lain..
"loe pikir ke Itali kaya' ke Lembang?" that feeling was so strong...I really yearn to go back to Tuscany! tapi mana ada writer block sampai hampir setahun? Pilih: Bangunan Heritage dengan fungsi Komersial TERBAIK di Bandung!! !